In love with the world! I had long intended to blog about the fat and plump sparrows that I saw daily, during my one year of happy life at Ooty. As it the #WorldSparrowDay today, I jumped on the occasion to dedicate a post to my little friends. My house was located in a residential area that had a lot of houses clustered together. In spite of this, there was a good amount of greenery around and lots of nook and corners. As a result of this, a variety of birds, especially the House sparrow was seen. Every morning, I would wake up to the chirping of a pair of these sparrows that had built a nest in the EB Box located outside my bedroom window.They were my natural alarm clock! The alarm of a clock would irritate me but these little birds’ chirping was such a delightful sound. I would wake up, go to the window and watch the pair go about their morning duties silently. Unaware of my presence,the birds would rest on the window sill, bump and peck at the glass pane of the window. A day thus begun was always eventful! 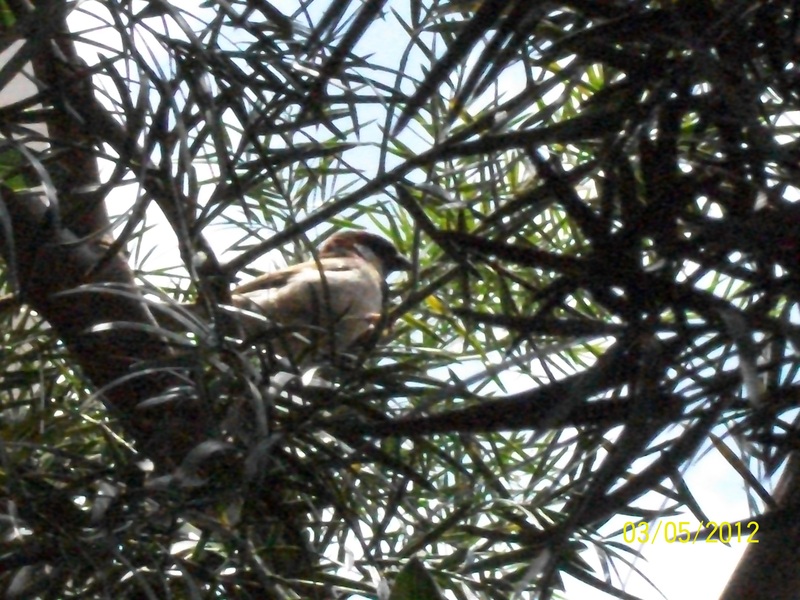 One of the pair that nested near my bedroom window – My natural alarm clock! As I buzzed about in the kitchen, another set of sparrows would pay their daily visit. A creeper grew on the wall next to the kitchen window and the this was a favorite haunt of these birds. They would jump from one branch to the other, chirping to each other. Suddenly one of them would swoop down to the kitchen window and peep in. I would go into silent mode once these sparrows are on the creeper, just to induce them to come into the window. Once they were confident that there was no danger in peeping through the window, I began to leave rice for them to peck. My happiness knew no bounds when finally one of the fat little sparrows, flew in and pecked the rice! My desk at work was opposite to a window and there were big bushes nearby. These bushes were constantly abuzz with the little birds flying in and out. To work alongside these busy buddies was always a delight! I would walk back home from work in the evening and I always enjoyed this walk immensely. With the chill air biting at my face and the sun slowly disappearing down the hills, I would walk back home. Very often it rained, but I loved to walk in the rain. As I dragged my tired body up the winding road to my home, the fat little sparrows perched in the bushes and trees nearby would cheer me up considerably. The birds will be there always, no matter if it rained or the sun blazed down.Their chirp-chirp would liven up my spirits and I would forget my worries instantly, I would just stand there and gaze at the fat little busy-bodies – I can never bring about that feeling in words! Ooty being a hill station had a suitable environment for many birds and that was one reason why the sparrows flourished there. The plains ( especially Coimbatore) are a sharp contrast with regard to the sparrows. Only in the outskirts of the city, far from the congestion of concrete structures, that we are able to sight these tiny birds. People do not want trees anywhere – how will these birds build their nests? Sparrows are fond of nooks and corners in our house verandahs and other such places in the house. But how many of us open up our homes? Almost every home is shuttered up tightly as they prefer privacy and also as every room is air-conditioned. How the hell will these birds survive then? #WorldSparrowDay is being celebrated by many nature conservation organizations in the city. Rallies, dressing up children as sparrows, distributing pamphlets to create awareness about the need to conserve sparrows are a total waste of resources and time. All I would say is “Open up your hearts and homes to the little birds”. They are an important and integral part of our ecosystem. A big SORRY to all those who were following my trek to the Himalayas, via my blog. Being a mom of an 8 month old girl takes much of my time and I was not able to finish my blog post. Here is the climax of the Himalayan trek! Subsequent days had the same routine – waking up early by 6 am, tucking in hot tea with breakfast, trekking till afternoon ,exploring till sunset, playtime till dinner and then snuggling into the cosy warm sleeping bags. 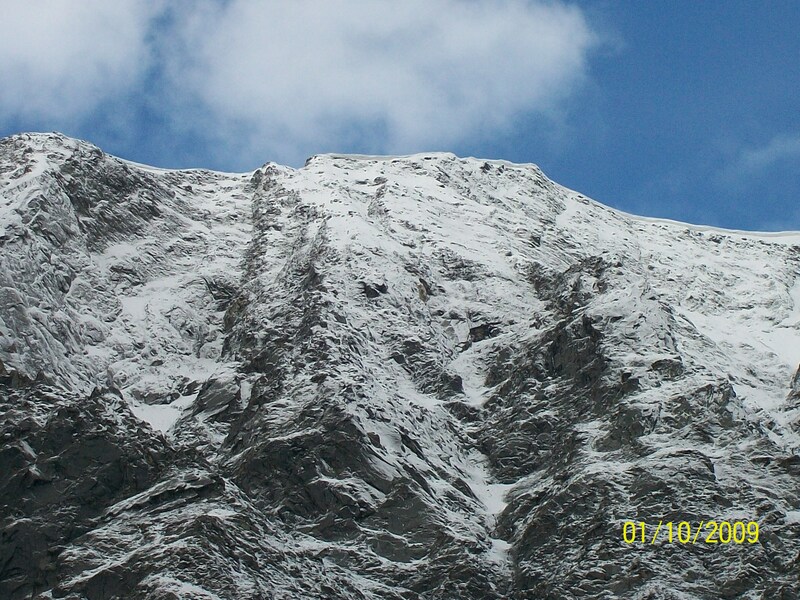 Every day we gradually climbed to higher altitudes and we could see the snow-covered peaks getting closer to us. The route was interspersed with little streams and pretty flowerbeds. At times we had to cross across the stream by jumping over the big boulders of rock. In the process of crossing a stream! It was a totally different world – it was us and nature, nothing else. We stopped when we felt live having a snack or a drink, took small naps on the grassy slopes without any single worry! Avalanche – I first came across this term in Tintin when Captain Haddock used to bring down the avalanche by shouting at his enemies. I never thought I would witness the same in my life. in our fourth day of the trek, the climate took a turn and it rained during the night. We were all frozen numb and had very little sleep. However the next morning dawned bright and clear. The moment I stepped out of my tent I was stunned – the mountains all around were all glittering with snowy white cloaks. It was such a sight! Suddenly there was a loud rumbling noise and a part of the slope on the mountain opposite to my tent began to tumble-down. Yes! I had just witnessed my first avalanche. It was all over in a minute! 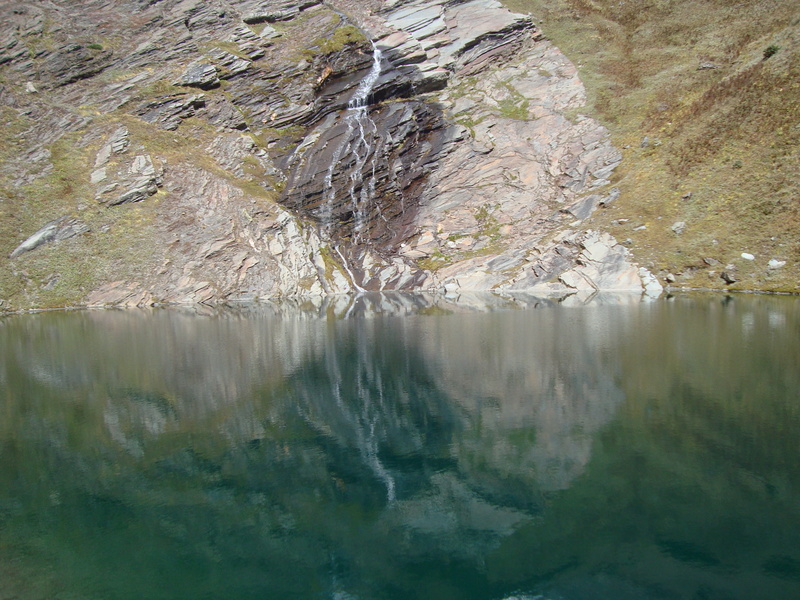 At Beaskund – Proud moment! We were close to our destination now, but it was a tough climb. And a long one too! We cheered each other up on the way and this took us to BeasKund . 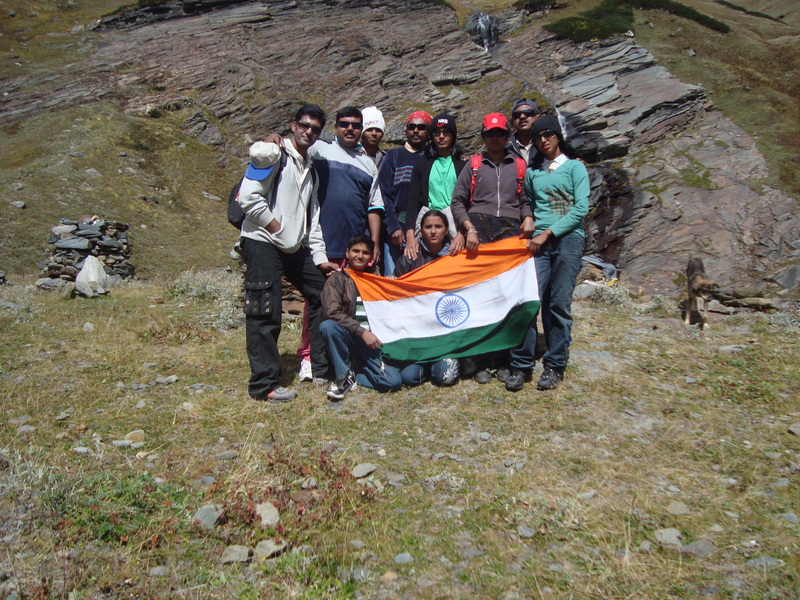 The youngest member of our team held the Indian Flag proudly upon reaching the source of R.Beas. The river trickled down from the mountain and formed a green pool before flowing down as the Beas river. Crystal clear, green water of R.Beas. I am at a loss to express my feelings at that particular moment ! Even as I am typing this out, my heart flutters happily with the memories. All of us were elated and soon were clicking pictures to treasure this splendid moment of our lives! Our team with the Indian Flag! 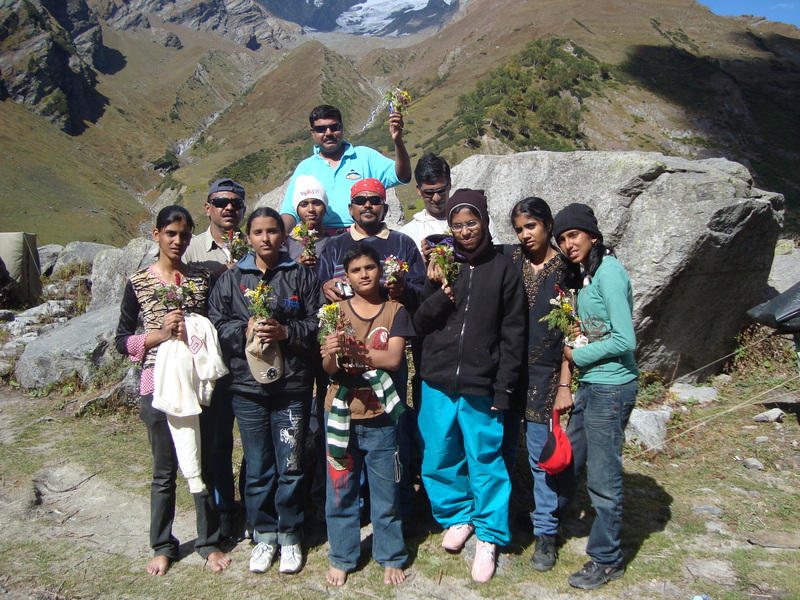 When we returned to camp, our guide and the helpers had got pretty little bouquets for each of us! Beautiful gesture to congratulate on completing the trek! It was a beautiful gesture and this was followed by a feast ! We were all totally fagged out after the arduous trek and the food vanished like magic! The return journey did not take much time for it was all a descent. We reached Solang Valley, from where we started out, in 2 days. We were back in earth. Yes, I felt that I was in an enchanted fairy land, all those days that I trekked up the mountains. No worries about people, work, study or materialistic things – we never had a bath during the 7 days ! I was in a world where everything around me was beautiful and happy! Nothing gives me more happiness than losing myself in nature and its beauties! Up in the mighty Himalayas – On the way to realizing my dream! All of us piled into a local jeep and were dropped at a place called Solang valley. This place was the starting point of our trek and our campsite for that night. We had a team of locals headed by a guide accompanying us.They took care of setting up our tents and also keeping our tummies full. Since we were exposed to a sudden drop in temperature overnight – from Delhi to Manali, it was very important to acclimatize our body to the local temperature. 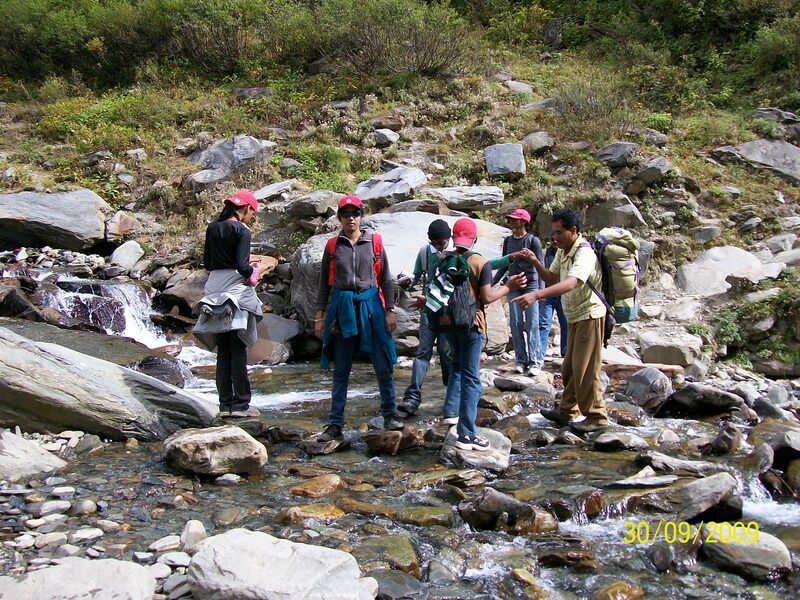 This was a daily routine during our trek as we began to gain altitude gradually. By the time the tents were put up, we had gobbled up steaming rice and dhal. As it was late afternoon, we decided to just relax and explore Solang Valley. The Himalayan mountains surrounded this valley and the snow-covered peaks towered in the distance. 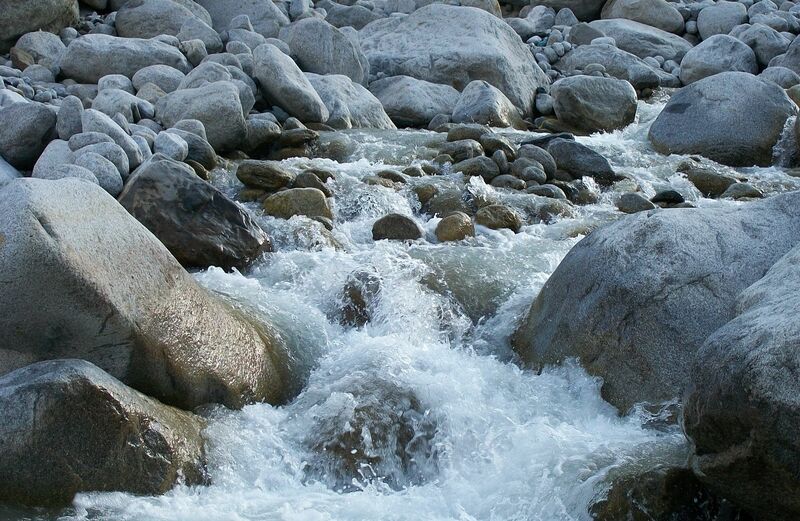 Beas River was gushing nearby – it was a gentle stream here with sparkling white water and it was pouring over mighty boulders of rock. I gingerly put one foot in the water and took it back at once – it was ice-cold ! Soon all of us were splashing the water on each other and squealing gleefully! It was great fun. We all lazed around and watched the sunset before heading back to camp. The warm evening suddenly changed to a chilly, cold one. I felt the chill on my face and shivered. It was biting cold. I covered myself up in layers of warm clothing, pulled on gloves and cap – now I felt a little warm! Darkness soon set in and the place was all quite. We had a separate tent for dining and since it was not yet supper time, we were all engaged in a game of cards. Soon, a wonderful aroma came from the kitchen tent and that was the end of our game! Hot Rotis and Kuruma – What a combination to feast upon in a cold place! We gulped down the delicious food amidst a lively chatter. 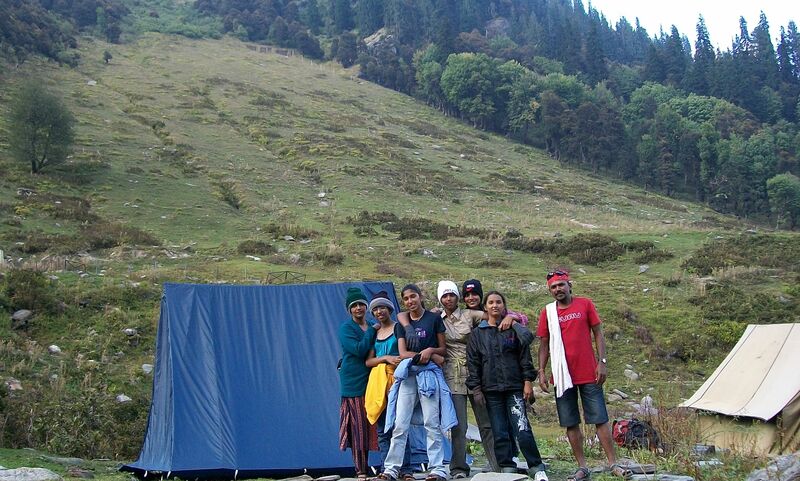 Solang valley was the only place in our trekking itinerary that had a mobile network tower. I called up my father and fiance ( I was engaged during this trek), rattled on about everything – from the journey to the food.That was the last conversation for we would be in total isolation, from the rest of the world, in the next seven days. It was only 8 P.M and too early to go to bed. So we lit up a campfire and huddled around it. We played games that involved physical activity as to keep ourselves warm. In spite of the warmth from the fire and thick jeans, I was shivering . It was the same for everybody else on the team. We were longing to snuggle into our sleeping bags. Four of us had to share our tent and it was fun setting our bags and zipping ourselves into it. It was terribly warm inside the sleeping bag! I was actually realizing my childhood dream ; I lay awake for a while listening to the eerie silence outside, taking it all in and then dozed off to sleep. The real trek starts now. Read about it in my next post! Living alongside the Ooty Roses.